Many people agree that “Big Gulp, Little Sip” is a good way to manage water in the Sacramento-San Joaquin Delta, but fewer agree what actually constitutes a “Big Gulp.” California WaterFix could help ease tensions over this problem by providing more flexibility in water diversions from the Delta. “Big Gulp, Little Sip” began to creep into California’s vocabulary a few years ago as a better way to manage water operations in the Sacramento-San Joaquin Delta. The basic idea is to capture lots of water when it is wet and to lay off the pumping when it is dry. Everybody seems to love the concept, but there is emerging a disagreement on what constitutes a Big Gulp. Is a Big Gulp what the wildlife agencies feel comfortable with diverting on any given day with the existing system? Or with a modernized system, could the Big Gulp be considerably bigger while still maintaining large storm outflows? The debate over the Big Gulp waned during last year’s record dry winter. This year, with a series of large storms and millions of gallons of water flowing through the Delta toward San Francisco Bay every second, the debate has come roaring back. It is hard to remember a year that has had such intense daily debates inside California water operations. To understand, some background is necessary on Delta plumbing – existing and proposed. The State Water Project at the Banks pumping plant in the Delta is capable of diverting water at the rate of 10,000 cubic feet per second (cfs) into the 400-plus mile California Aqueduct. 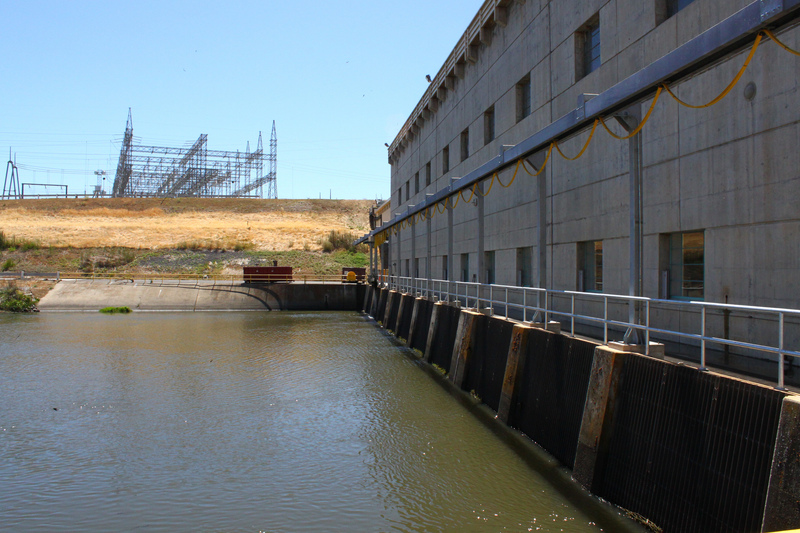 A short distance away, the Jones pumping plant of the Central Valley Project is capable of diverting 5,200 cfs into the 117-mile Delta-Mendota Canal, which has a slightly smaller capacity of 4,600 cfs. Combined, the two systems can divert nearly 15,000 cfs. This, by anyone’s definition, is the very maximum Big Gulp. If California WaterFix and the new northern Delta intakes were constructed, they could divert a maximum of 9,000 cfs. Remember that the size of the downstream aqueduct system would not change. So California WaterFix basically would provide flexibility in terms of when, where and how much water to divert. And perhaps some new choices for Big Gulps. What is the Big Gulp debate all about? Let’s take one recent day, March 15, as an example. Some storms had just walloped Northern California. More were on their way. 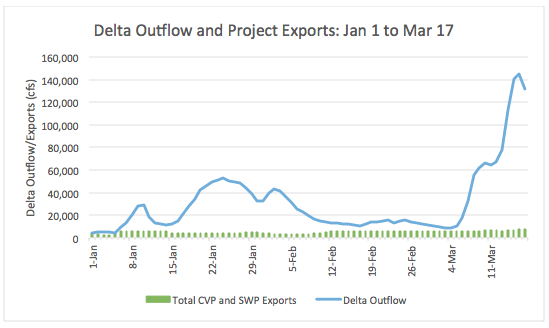 During the bone-dry period of February, outflow from the Delta to San Francisco Bay had dropped to about 14,000 cfs on a typical day. A typical pumping level down at the CVP/SWP pumps was a combined 6,000 cfs. Now the outflow has swelled to more than 145,000 cfs. And on March 15, the level of pumping permitted by the various state and federal wildlife agencies was 6,600 cfs. For some environmental group stakeholders, this constituted a Big Gulp.For it was the “maximum level” permitted by the agencies and their self-written pumping restrictions via the Endangered Species Act. Had California WaterFix been in place and operating under its proposed (take note of this important adjective; none of several important permits to settle this issue have been issued) operations, the gulp would have been more than twice the size. Flows down the Sacramento River were sufficient to fill the tunnel pipelines at full capacity. That, plus permissible diversions from the existing CVP/SWP pumps in the south Delta, would have filled the California Aqueduct and Delta-Mendota Canal to capacity. My take is that what has been happening this winter in the Delta is nothing greater than a Medium Gulp. Constrictions in the current system explain why storage levels south of the Delta are lagging those in the north. The Big Gulp debate is as big as it gets in terms of its stakes. Everyone seems to agree that stormwater capture is an essential part of California’s future water portfolio. Yet there is no larger source of stormwater for California, both its environment and economy, than the Sierra. The balancing act is far from over and fiercely debated. And plumbing in the Delta, whether it is what is there today or ultimately modernized, really matters.